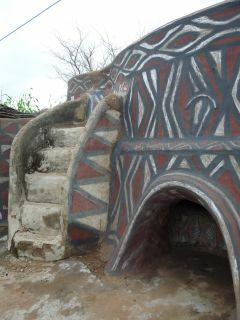 Little evidence remains of Ghana’s early history. The oldest archaeological findings date back to about 3.800BC but it is supposed that the region was inhabited by humans 30.000 to 40.000 years ago. In the 9th and 10th centuries successive waves of migration from the north and northeast arrived on present-day Ghana’s territory and between AD1000 and 1500 major migratory movements took place in the Volta Basin. The most population groups presumably arrived at what is Ghana today about 1000 years ago and later. In 1471 the Portuguese reached the Gold Coast while searching for the sea route to India. They established themselves initially lured by the trade in gold, ivory and spices. 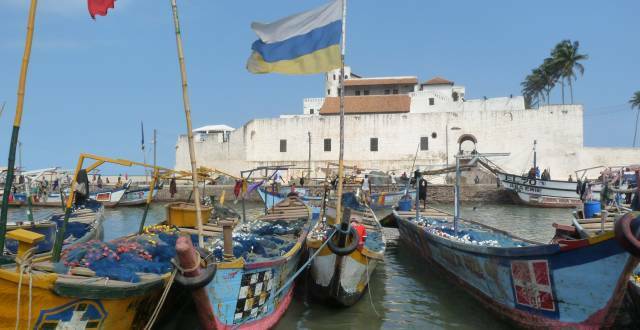 Their economic interest so increased that in 1482 they built their first permanent trading post on the western coast of present-day Ghana, the castle São Jorge da Mina also known as Elmina Castle, constructed to protect Portuguese trade. The Portuguese position on the Gold Coast remained secure for almost a century. Then they were challenged by the Dutch, Britons, Danes, Swedes and French. With the opening of cotton, tobacco and sugar cane plantations in the New World during the 16th century, which suddenly increased the demand for slaves, people rapidly replaced gold as the principal export of the region. Dozens of forts and castles were built by the Europeans to serve as trading posts and also as prisons where the slaves were kept before they were shipped abroad and so in effect were dungeons as well. 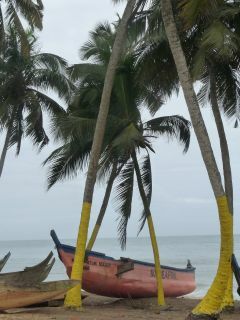 Nowhere else along the West African coast there is such a dense concentration of castles as on today’s Ghanaian coast. Competition was fierce among the different European powers, so the castles were attacked, conquered, sold or exchanged over the centuries. Their struggle for dominance proved to be very expensive and man-power intensive, so most Europeans withdrew from the country and by the beginning of the 19th century Britain was the major European trading power.In 1821, the British government placed all the forts formerly run by its trading companies under its control, because the companies had signed a treaty of friendship that recognized Ashanti claims to sovereignty over large areas of the coast and its peoples.In the centre of present-day Ghana the Ashanti Empire continued to try to expand their territory. This empire had emerged in the 17th century and by the 18th century had become the most powerful Akan kingdom and taken control of the trade routes to the coast. This brought them continuously into conflict with the coastal tribes and also with the British and sparked a series of wars. These attacks led Britain to the decision to give back the control over trade to the trading companies. In 1844, however, the British government took the control back and later abolished the African Company of Merchants and seized privately held lands along the coast.On 24 July 1874, Britain formally declared the Gold Coast a Crown colony. In that same year, the British sacked the Ashanti capital of Kumasi. From 1895–1896 the British and Ashanti fought in the Fourth and final Ashanti War, which ended with Britain’s victory.On 1 January 1902 Ashanti and the northern territories were formally annexed to the British Gold Coast colony. King Prempeh II was held in exile until 1924 and was returned to the stool only in 1926. Britain applied the system of indirect rule which meant that traditional chiefs would rule locally as before, but under the supervision of the colonial administration. During the colonial rule resistance emerged. In 1914 the National Congress of British West Africa led by Africans was founded. It claimed equal job opportunities for Africans and Europeans with equivalent qualifications and demanded that the colonial administration should cease interfering in the selection and removal of traditional chiefs. However, their demands were not accepted by the British. World War II, finally, proved decisive in ending the colonial era in the Gold Coast. More than 50,000 Ghanaians fought in the European war. They returned home with high hopes of benefiting from the democratic ideals for which they had been obliged to fight, but instead they encountered unemployment and a shattered economy which led to increasing demand for freedom. In 1947 the United Gold Coast Convention (UGCC) was formed. They demanded “self-government within the shortest possible time”, but they were not resolute enough. In that same year, Dr Kwame Nkrumah was invited to serve as the General Secretary to the UGCC. When in 1948 colonial officers opened fire on a peaceful march three marchers were killed. During the following riots Nkrumah and other party leaders were arrested, for the government suspected the UGCC was behind the protests. On his release in 1949, Nkrumah formed his own party, die Convention People’s Party (CPP) with the slogan “self-.government now”. As the leader of CPP he led the Gold Coast to independence. Ghana’s population of about 25 million makes it one of the most densely populated countries in West Africa. 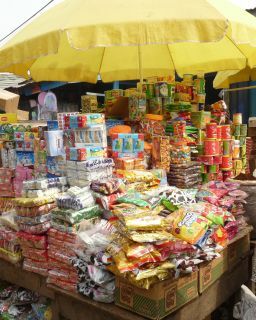 Approximately 4 million of them live in the Greater Accra Region. 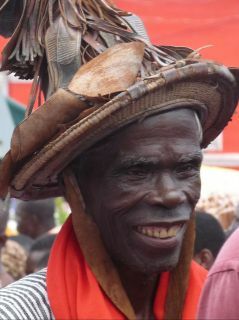 The Ghanaians are classified into four major ethnic groupings. These are the Akan who constitute about 50% of the total population, the MoleDagbane group (17%), the Ewe (13%) and the Ga-Adangbe (about 8%). The Akan group is divided into several sub-groups including Fanti, Ahanta and Nzima in the south and Ashanti, Ahafo and Bono in the centre of Ghana. The second largest group, the Mole-Dagbani, includes Kokomba, Chamba, Telensi, Sisala,Vagala, Templensi, Dagomba and Gonja. Ada, Krobo, Shai and Ga belong to the Ga-Adangbe group. The Ewe are the only non-indigenous group among them. There are also some millions of foreigners in Ghana, most of them from neighbouring countries, such as Burkina Faso, Nigeria, Togo, Ivory Coast and Liberia. No official figures seem to be available but it is thought that about 40%-45% of Ghana’s population have traditional beliefs, including the religions of the Akan and Ga. Many people retain traditional beliefs alongside Christian and Muslim religion. Christianity dominates in the south of the country: Christians constitute about 30 – 35 %, The Christian religion is further broken down into Catholic (10%) and Protestant (20%), which are divided into Presbyterians, Pentecostal/Charismatic, Methodists, Baptists and others. About 20% of the population is Muslim; the majority is found in the north of the country. Freedom of religion is a constitutional right in Ghana and the majority of Ghanaians is religious tolerant towards people of other faiths. There are families consisting of Christian and Muslim members who live together in harmony. English is the official national language, and it is widely spoken as a result of the country’s long links with Britain. But a total of 79 different languages and dialects are spoken, generally divided into Kwa and Gur languages. The main language is Akan which belongs to the Kwa language group. Fanti, Twi, Brong, Akim or Akwapim constitute dialects of Akan which is spoken or understood by about 70% of the population. Other languages are Ewe, Abron, Farefare, Dagbani, Dangme, Ga; Konkomba and Hausa. During the last 50 years the Ghanaian government has established 70 national parks, sanctuaries and conservation areas to protect the country’s plant life and wildlife. Ghana’s vegetation can be divided into three major zones: tropical rainforest and wet savannah in the southwest of the country, woodland savannah and grassland in the north and centre and a narrow strip of coastal savannah in the south. The original rainforests once covered an area of 85000 sq. 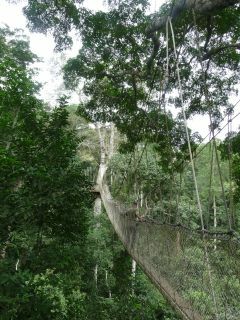 km, which has been reduced by logging to 40.000 sq. km in less than 50 years. More than 300 species of large trees cover Ghana’s rainforests including mahogany (Khaya), different species of ficus and albizia trees, “Iroko”, also known as “Odum” (Milicia excelsa), “Bediwonua” (Canarium schweinfurthii) and silk cotton trees with their impressive buttress-roots (Ceiba pentandra), called “Onyina” in Ghana, as well as “Otuwere”, whose huge thorns were removed, then carved and used like rubber stamps in the past. Epiphytes, such as bromeliads and orchids grow on many trees in the rainforest. The forest gives way in the north to the drier flatlands of the savannah, dominated by distinctive baobabs (Adansonia digitata), karité trees (Vitellaria paradoxa) and mango trees (Mangifera indica). The red silk cotton tree (Bombax ceiba) is also found in the dry savannah. This tree is native to tropical Asia and has beautiful red to orange flowers, which appear when there are no leaves. Different species of acacia are also widespread in this region. Coconut trees and mangroves are among the most characteristic plants of the coastal plains. A wide variety of ornamental trees grow in the streets and gardens of Ghana’s towns including flamboyant, bougainvillea, hibiscus or jacaranda. Oil palms are cultivated in the South of the country. This plant is native to Guinea and is one of the most important economic species of palm family. Leafs and branches are used to make roofs, red palm oil is extracted from of the pulp of the fruit and white oil from the kernel. They are both used in the food industry. Red oil mixed with cocoa pod ashes is used to produce soap and palm wine is very popular beverage. Other useful trees cultivated in Ghana are the kola tree, the American calabash tree, cashew nut and rubber trees. A number of exotic fruits are grown: pineapple, citrus fruits, banana, guava and avocado.The most important commercial crop in Ghana is cocoa. The Aburi Botanic Garden is one of the most fascinating places in Ghana for those who are interested in plants. 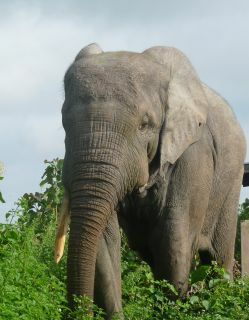 Ghana’s national parks are home to a number of endangered animal species. The Kakum National Park protects the rare forest elephant, forest buffalo and giant forest hog, as well as bongo antelope and mona monkey. 93 mammal species, 33 reptile species and 9 amphibians occur in Mole National Park, Ghana’s largest wildlife sanctuary. The park is a good place to see elephant, warthog, kob antelope, Defassa waterbuck, bushbuck, baboon and vervet monkey. Lion and leopard live in Mole, as well as the African wild cat, but only occasional sightings are reported. Mole is home to the largest population of buffalo in Ghana. Five primate species are present, baboon, chimpanzee, vervet monkey, mona monkey and Roloway monkey. Ghana is a country with great birding potential, 744 species occur here. Mole National Park is a good birding site with more than 300 species recorded. The lowland forests harbour 15 endemic species, of which 14 are globally threatened. Following reserves offer superb opportunities of bird-watching and are recognised as Important Bird areas: Ankasa-Nini-Suhien NP, Bia NP, Kakum NP and Mole NP, Atiwa-Atwirebu FR, Cape-Three-Points FR, Afadzato-Agumatsa FR and Assin-Atandasu FR, as well as Songaw Lagoon and the Volta mouth. Various egret and heron species including black-headed heron, great egret and cattle egret, black kite, common buzzard, spur-headed plover, white-headed and black-headed lapwing, African jacana,black-winged stilt, a variety of kingfisher, bee-eater and hornbill species are easily sighted. In Ghana, crocodiles are found. They are most easily observed at Paga where they are held sacred by locals. Among the snakes spitting cobra, black and green mamba and puff adder are widespread, but they are very shy and unlikely to be seen. Other reptiles commonly encountered in Ghana are lizard, agama species and the common house gecko. Water and savannah monitor are occasionally seen. The various chameleon species are most likely to be found on voodoo markets as ingredients for charms and fetishes. 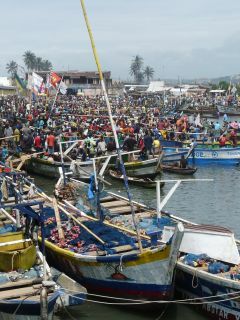 Ghana’s Atlantic coast is one of the world's most productive marine areas that is rich in fishery resources. The waters have large fish species diversity including barracuda, herring, mackerel, shark species and tuna, as well as other marine animals such as lobster, crayfish, octopus, mussel and marine gastropods. The country spans an area of 238,500 km2 (92,085 sq mi). It is surrounded by Togo to the east, Côte d'Ivoire to the west, Burkina Faso to the north and the Atlantic Ocean to the south. Ghana can be divided into five different geographical regions: the Low Plains including the coastal plain, the Ashanti uplands, the hilly Akwapim-Togo ranges, the Volta Basin and the High Plains. The low-lying coastal plain runs between 100 and 150 km inland of the Atlantic coastline. It is dominated by wide sandy beaches and mangrove swamps. In the western part of the country to the north of the coastal plain lie the Ashanti Uplands reaching heights of about 450m. At the heart of the country is the low-lying Volta Basin, which takes up most of central Ghana. It drains about 70% of the nation's total land surface.Extending about 1,600 kilometers in length the Volta is Ghana’s largest river. It has three branches, all of which originate in Burkina Faso: the Black, Red and White Volta. The construction of the dam at Akosombo created Lake Volta, the world’s largest artificial body of water. The High Plains occupy the northern and northwestern sector of the country. They consist of a plateau, which averages between 150 and 300 meters in elevation. In the northeast the Gambaga Escarpment rises almost 500m over the plains. 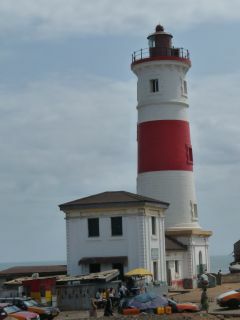 Ghana's highest point is Mount Afadjato which is 885 m (2,904 ft) and is found in the Akwapim-Togo Ranges in the southeast. The Akwapim-Togo Ranges are part of the Atakora Mountains that stretches through to Benin. Agriculture remains the most important sector, employing more than 50% of the Ghanaian workforce. Ghana’s principal agricultural products are basic foods including maize, rice, millet, yams, cassava, plantains and fruits and vegetables. Along the coast and on lakes and rivers fishing is vital to the local economy. Monoculture in cocoa, sugar cane, coffee, oil and rubber production is another widespread farming practice. However, the processing industry for these products does not exist. 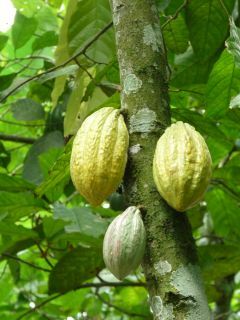 Ghana’s most important cultivated plant is cocoa. The country is the world’s second-largest cocoa producer. Roughly 1.5 million people are employed by the cocoa industry. Ghana is a resource-rich country. Along with cocoa, gold makes the most important contribution to exports. Ghana is one of the world's top gold producers. Due to its wealth of gold the country was formerly called "Gold Coast". the largest gold mines are in Tarkwa and Obuasi. Ghana has significant deposits of lead, tin, copper, tantalite and iron ore, but there are only small mining activities to exploit these minerals. Ghana also has deposits of diamonds and bauxite and is one ot the world's largest exporters of manganese. An oilfield which is reported to contain up to 3 billion barrels of light oil was discovered off the coast in 2007.The export of precious woods is another source of income. 23 species of precious wood occur in Ghana. For environmental reasons, the export of some types of wood has been banned in Ghana, but economic interests are often given higher priority than environmental protection. Exotic woods are Ghana's third largest export commodity after gold and cocoa. The industry sector provides only 15% of the GDP. Light industry is the most important industrial concern. The large-scale manufacturing sector includestextiles, sugar, beer, refrigerators and radio sets. Beside the light industries, there are also heavy industries mostly found in the Greater Accra Region including cement industry, vehicle assembly, aluminum and steel processing and chemical industry.